A story of one’s will to overcome and survive without bitterness. Shabdar Ali, a Bangladesh who worked as an electrician suffered an accident at his construction site in March 2013. It broke his limbs, his body and left him blind in one eye but not his spirit, even though he had to undergo 13 operations to repair his body. I first met Shabdar Ali at a Culture Kitchen event, where South Asian migrant workers and other Singapore residents gathered over a hearty meal of Briyani (flavoured rice dish).He came across as an unassuming and friendly person, and though I don’t quite remember what we spoke about, our brief conversation left me with a good impression of him.But it was night time and he was wearing a pair of dark sunglasses – that sparked a few questions in my head. I thought I’d save those for the next time we met. A few weeks later, I found myself sitting at the same table as Shabdar, both of us volunteering at TWC2’s (Transient Workers Count Too) Cuff Road Project, which gives out free meals to injured migrant workers. I turned to him and asked: “So bhai, tume ki sharmosha?” (So brother, what problem did you have?). For the next 40 minutes, he told me about his work-place injury and his experiences undergoing treatment. He then removed his sunglasses to reveal what to me was a grotesque and appalling sight: his left eye surrounded with small translucent plastic bolsters and purple stitches. It looked damp; perhaps with pus? 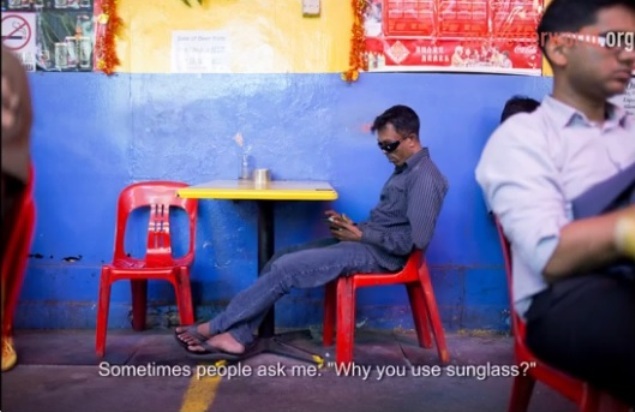 “If I glasses no wear, people look at me and they will be scared,” he said. Despite his injury, he has not become an antisocial recluse, which seems to me like the easiest form of coping or escape. Instead, he displays a resilient and positive outlook in life, which I find deeply laudable. He also spends his time helping other migrant men in need, and being a friend to many. In the few months of our friendship, he has rarely shown his weak side, despite the various strains on his life – his medical condition and trying to get an insurance payout; not being able to provide for his family; and this in-limbo state while waiting for his case to be resolved. It makes me wonder if I would be as strong, if I were in his shoes. Postscript: More than a year after being injured, Shabdar went back to Bangladesh on 8 April, 2014. His employer, whom he said did not take care of him following his injury, has ceased operations after filing for bankruptcy. His case is still not resolved and it is unclear whether the Ministry of Manpower will proceed on any action against his former employee. You can help fund urgent and essential medical treatment for workers like Shabdar by contributing to TWC2’s Care Fund (please earmark for Care Fund). TISG thanks Our Better World for sharing this story with us. It was originally published here.